The concept of family has evolved in recent years, and one particular family dynamic is rapidly increasing. 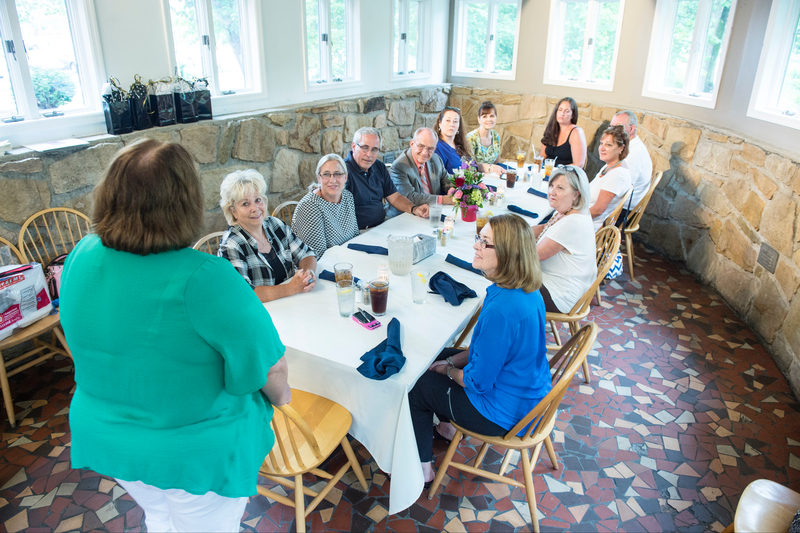 Grandparents are continuously stepping into the role of parent by becoming fulltime caregivers to their grandchildren, and West Virginia is among the most impacted states. According to U.S. Census data, West Virginia ranks fourth in the nation for grandparents raising one or more of their grandchildren. 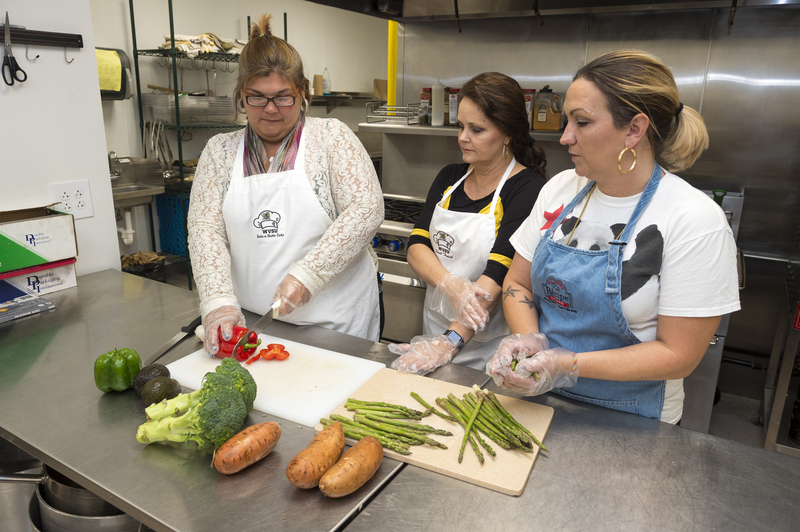 To help meet the growing needs of this population, West Virginia State University (WVSU) launched Healthy Grandfamilies, a series of free informational sessions and resources, including follow-up support with a licensed social worker. The project seeks to help ease the transition many grandparents face as they once again become a parent, often to very young children and with issues that didn’t exist when they first were raising children. Topics in the discussion sessions range from how to address social media to navigating the school system. In addition to the discussion sessions, which also focus on such topics as communication, technology, nutrition and stress management, participants are provided three months of free follow-up services with a licensed social worker that include assistance with locating community resources, confidential help in meeting family needs and advocacy services. The program is also proving to be a haven for emotional support. Dunn quickly discovered that participants are overwhelmingly raising grandchildren because of a substance abuse issue with the biological parent. While providing such information isn’t a requirement, it is coming to light anyway – along with the guilt associated with it. 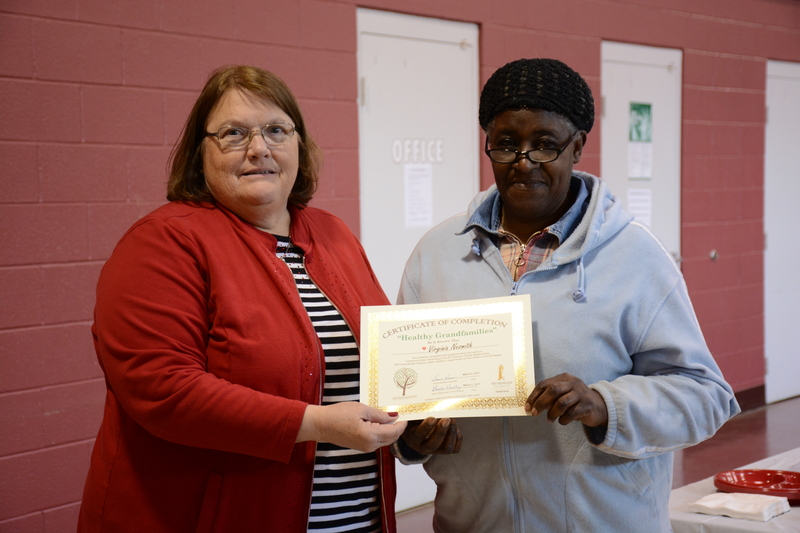 To date, the program has reached approximately 80 grandparents raising more than 150 grandchildren – and counting. After a strong launch in Kanawha County, W.Va., the program has expanded into two additional counties, with hopes of graduating 100 participants by the end of 2017. Plans are underway to expand into three more counties in 2018. To learn more, visit www.HealthyGrandfamilies.com. Healthy Grandfamilies is funded by the USDA National Institute of Food and Agriculture’s Capacity Building Grants Program, Award No. 2015-38821-24374. Summer seemed to hang on well into the fall months this year, but by December winter temps finally hit the Mountain State and early January is bringing about our first accumulating snow. It’s the perfect time of year to warm yourself with a hot bowl of homemade soup, and one of my favorites is good ol’ tomato soup. This recipe is adapted from the Runner’s World Cook Book 2013 and is a healthy, delicious remake of classic tomato soup that adds chickpeas. Chickpeas are a great source of fiber and protein, and tomatoes are full of cancer-fighting antioxidants. To round out the meal, try topping with a tablespoon of cheese and serve with a side salad. Add the onion and cook until soft, around 4 minutes (stirring frequently). Add the garlic and cook for about 30 seconds. Add the tomatoes and broth, raise heat and bring to a boil. Reduce heat to low and simmer for 5 minutes. Add sugar and black pepper. Add the chickpeas and simmer for 10 minutes. Carefully transfer to a blender (work in small batches, or the steam will build up in the blender. Only fill 1/2 – 2/3 of the way full). Blend ½ of the soup until mostly smooth, you may see bits of tomato and chickpea. Return to remaining soup in the pot and serve. In our recent Getting-Started Guide to Canning post, we introduced Matt and Marsha Wood, our very own “Canning Couple.” In this post, Matt and Marsha use their holiday leftovers to make turkey stock. Cleaning up after the family Thanksgiving get-together, my sister-in-law got onto Marsha about the turkey and bones that she was just going to throw away. I suggested turkey stock in the pressure cooker. Marsha looked up a recipe for turkey stock on the Internet, but doesn’t remember the site she found it on. It called for bay leaves, salt and pepper with carrots onions and celery, and enough water to cover the bones. I later found Pressure Cooker Diaries with general directions. Cut up 4 stalks of celery, 6 baby carrots and 1 onion into a 22-quart pressure canner. Place turkey bones with a little meat into the pressure cooker. About 1 tablespoon each of poultry seasoning, salt and pepper. We didn’t have any bay leaves. Heat the pressure canner until steam starts to escape from the regulator vent. This took over an hour because of the amount of liquid. Once the weight giggled I checked and the pressure was 15 pounds per square inch (PSI). Lower heat to just maintain 15 PSI. Remove from heat, let pressure cooker cool. This took several hours. Once cooled, remove the bones, then strain. I brought the stock back to a boil adding some additional poultry seasoning and salt. Please see previous posts and the National Center for Home Food Preservation for complete canning directions. Wash pressure cooker, jars, rings and new lids. Preheat jars and lids. 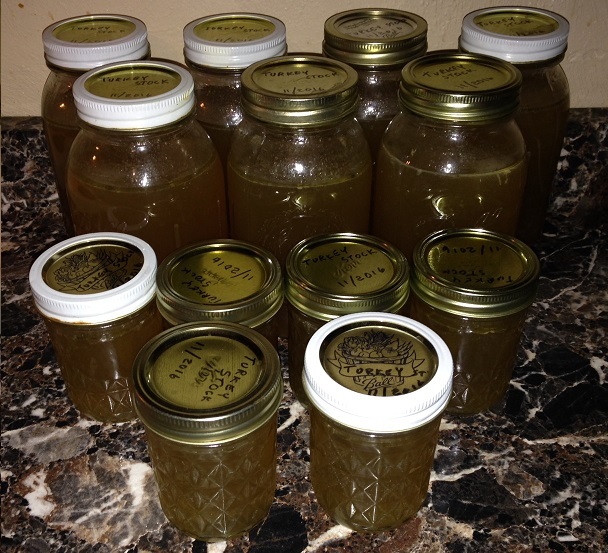 Fill jars with stock within 1 inch of the top of the jars. Place bottom plate and 4 cups of water in pressure canner. 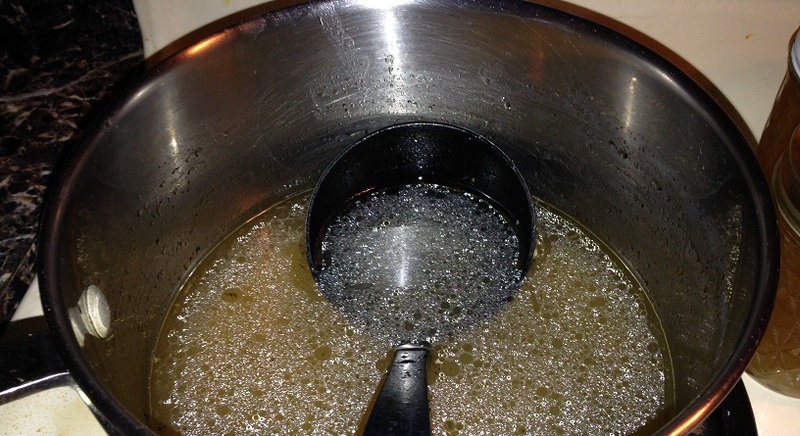 Place 7 quarts in bottom of canner, Then insert spacer, place ½ pint jars in canner. Heat on high until weight giggles and pressure is at 15 PSI, reduce heat process for 25 minutes. At end of processing time, remove from heat and let the canner cool. Once pressure reaches 0 and the canner is cool, unlock and open the lid. Remove the jars from the pressure canner using a jar lifter and place upright on a towel, allowing to cool undisturbed for 12 to 24 hours. I did get a bunch of jars of stock. 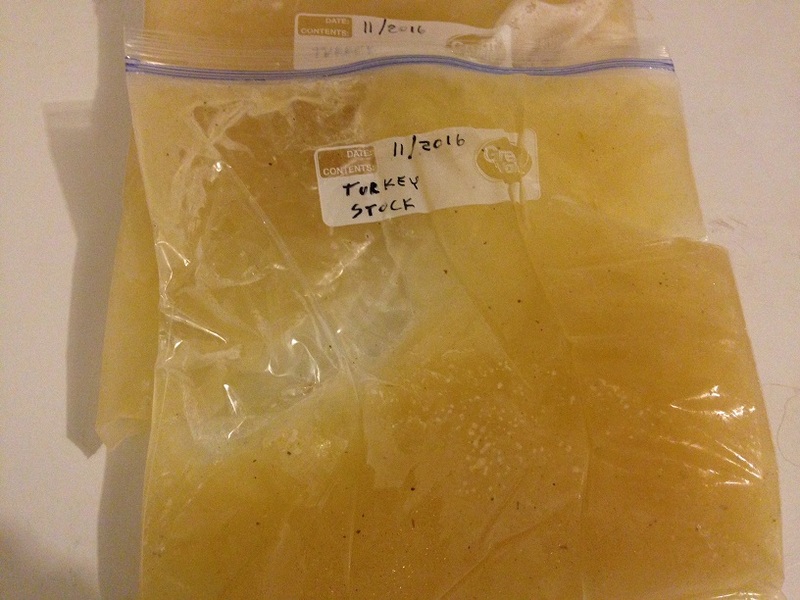 I also put some of the stock (5 or 6 quarts) into freezer bags, laid them flat on cookie sheets and put them in the freezer. I had about a quart left that I made turkey and dumplings by substituting turkey for chicken in Paula Deen’s recipe. Thanksgiving is a time for good food and drink with family and friends, but the common centerpiece of the holiday dinner – especially Thanksgiving – is turkey. And while delicious, turkey does have its own set of preparation steps that must be carefully followed to ensure it is cooked appropriately. Here are a few guidelines that will ensure all your guests remain happy and healthy during your “turkey day” festivities. Thawing: There are a few ways to thaw a turkey, but the best is to thaw it in the refrigerator. This will allow the turkey to thaw at the proper temperature, which also slows the growth of harmful bacteria. If you must use water to thaw your turkey, make sure the water is cold and drain it frequently to maintain the cold temperature. Next, remember the letters “CSCS!” when the real turkey prep begins: Clean – Separate – Cook – Clean Up. Clean: Wash hands, utensils, surfaces, and fruits and vegetables. Do not wash the turkey or eggs. Separate: Keep all the meats separated from other food items by using separate cutting boards, utensils and towels. Wash your hands when switching from one utensil or recipe to another. Keep a sink full of clean, soapy, hot water to wash your hands as you are preparing each recipe. This ensures that no cross contamination occurs. Cook: Yay! It is time to put the turkey in the oven. Try these helpful hints for a safe, delicious holiday! For a quick clean-up, purchase a turkey cooking bag at your local grocery store. This not only saves time on cleaning but also makes for a more moist and flavorful dinner. When stuffing is cooked inside the turkey, it is more moist and flavorful, but it absorbs some of the fat from the bird, so keep that in mind when calculating your caloric intake. Stuffing can be a source of foodborne illness, especially if placed inside the bird. Make sure all cutting boards, spoons, bowls and hands are very clean when preparing the mixture. Never stuff the bird before you are ready to bake it. Do not pack the cavity tight as the center may stay at the “temperature danger zone” too long. Clean up: Do not leave your Thanksgiving dinner out on the table beyond two hours after having taken it from the oven/stovetop to the table. If you want to cook your turkey unstuffed, add extra flavor by placing the following items in the cavity of the turkey: one celery rib, one onion cut in half, and one whole carrot. Otherwise, try our Healthy Holiday Stuffing recipe below. Wash, peel and finely chop carrots, celery and onion. Place in a medium saucepan with broth and bring to a boil. Cover, turn heat down and simmer for 5 minutes. Slice mushrooms. Heat nonstick skillet over medium heat. Remove from heat briefly and spray with non-stick cooking spray. Return to heat and add mushrooms to saute. Place stuffing mix in large bowl. Add mushrooms and vegetables in broth. Toss lightly with a fork. Spray baking dish lightly with cooking spray. Spoon stuffing into baking dish. Cover tightly with foil. Bake at 325 degrees. If you choose to stuff your turkey, be sure to do it loosely. In our third, and last, installment of “Thrifty Thursdays,” we are going to talk about Cyber Monday shopping tips. The term “Cyber Monday” was coined in 2005 as a reference to the Monday after Thanksgiving, where marketing companies were trying to sway people to shop online. This year, the online shopping event will take place on Monday, November 28. Below are some tips to help you get the most out of your shopping. Most sites will release their ads a few days in advance, so take a look to see who is offering what and make a game plan. Also, let the deal bloggers do the work for you. Find a site or two to browse and you can save yourself tons of time. They will have the latest on promo codes, pricing and even some unadvertised offers. If you know where you are planning to shop ahead of time (which you should, because you already scouted the ads, right? ), take a few minutes ahead of time to create a customer account if you don’t already have one. This will save you time during checkout and will help you move on to the next site, and sale, quicker. Everyone loves to get more bang for their buck. One way to do this is to purchase discounted gift cards ahead of time for stores that you plan on shopping at. Another way to do this is to order through a rewards site to earn points or cash back. Or, if you are feeling generous and are shopping on Amazon, use Amazon Smile to have a portion of your purchase donated to a charity of your choice. Some sales only have a limited quantity of items or are only on sale for a certain amount of time. Be aware of this and plan to hit these sales early in day (or whatever time the sale starts) so you don’t miss out. Amazon offers early access to most of its Lightning Deals to Prime Members. There’s nothing like thinking you’re getting a great deal on your items only to find out when you go to checkout that the shipping is almost as much as your items. Make sure you are aware of the site’s shipping costs before you spend time shopping. There are some sites out there that will gather information for you on who has free shipping (thank you deal bloggers!). Another option to consider is to ship the items directly to the recipient. This will save you from having to travel with additional items. This is an especially good idea if you are flying for the holidays! As always, when shopping online, make sure your computer is up to date with the latest anti-virus software and is protected from anti-spyware. Shopping on trustworthy sites is always the best way to ensure your personal information will be handled safely. To ensure your online purchase is secure, before paying, look in the address box for the “s” in https:// and in the lower-right corner for the lock symbol. Paying with credit cards or PayPal are often easiest when shopping online because, if something does happen, it is always possible to dispute unauthorized charges. Hopefully these tips have helped you prepare for your holiday shopping. Good luck out there! Black Friday has become, in a sense, a holiday of its own. Love it or hate it, one thing is for sure: it is the unofficial kickoff to the holiday season. With sales everywhere you turn, why not take an opportunity to save yourself some cash while buying gifts for your loved ones? Joining a store’s loyalty program can get you special deals, sneak peeks, extra coupons or earn you store cash. Make sure you sign up for these loyalty programs before you head out for your Black Friday shopping. Just like signing up for store emails, another great way to stay up to date with the latest news, products and sales is to follow the company on social media. It is not uncommon for stores to offer exclusive sales to their social media followers, so keep your eyes peeled! If you do purchase gift cards to shop with, consider using an app like Gyft so you can leave the bulky cards at home. Gyft not only stores your gift cards on your phone for you, but it also keeps an updated account of what is left on the card as you make your purchases. Some stores offer guarantees for Door Buster sales during a certain period of time on Black Friday. This means that even though they may have sold out of the actual item, you can purchase a voucher at the advertised price during the block of time and will be able to pick up that item before Christmas once it is in stock again. Also, it is worth noting that just about all of the sales offered in-store are also offered online, with the exception of Door Busters. These are just a few shopping tips that I’ve found that help me. Do you have any other tips you’d like to share? If so, comment below! May your cart always be full and your checkout lines be short. Good luck! Not interested in fighting the crowds on Black Friday? Maybe online shopping in your pajamas is more your speed? Check back next week for Cyber Monday shopping tips. ‘Tis the season to start shopping for the holidays. Even though it is well before Thanksgiving, it’s never too early to start getting organized and getting ahead of the game. (I started back in October; don’t judge me.) Below are some time- and money-saving tips to help you get started. There are plenty of apps out there that can help you keep track of your Christmas lists, but I find Google Docs to be the easiest, because I already use it a lot as is. Plus, I am able to access it on my computer or phone and share my list with my husband so we can make sure we don’t miss buying for anyone. When purchasing gifts in advance, sometimes you may come across a better deal closer to the holiday. As long as you’re still within the timeframe of returns, that’s not a problem. Not to mention, it can also give you the flexibility to shop around but still make sure you were able to snag that “got to have” item on your list. An example of this would be wanting to buy one of the “must have” toys of the season, but you’re not sure if you’ll be able to find it on Black Friday or Cyber Monday when everyone else is looking for the same item. Don’t fret! All you have to do is buy the item ahead of time (noting the timeframe you have to return it) and then when Black Friday and Cyber Monday come rolling around, do your best to try to get the item at the deeper discounted price. If you can, great! Go ahead and return the first item you bought at the higher price. If you didn’t get it, that’s o.k. because you were still able to get the item you wanted, just not at the discounted price. Shipping for many online retailers is free during the holiday season. Some sites have a minimum that you have to purchase to get free shipping; however, many of these sites waive that during the holiday season. Either way, when shopping online, be sure to note how long it will take to deliver the items to ensure you receive them in time for the holidays. When it comes to online shopping, be aware that not all returns are free. Sometimes you will have to pay the shipping to return an item. However, PayPal is offering free return shipping this holiday season on items that you purchase through your PayPal account. Mobile apps are becoming more and more prominent when it comes to shopping. It is not uncommon for these apps to offer additional discounts or special promotions. Two examples of these are the JC Penney app and the Target Cartwheel app. The Cartwheel app offers weekly discounts in addition to what is offered in their circular. These discounts can also be stacked on additional coupons and sales, giving you even bigger savings. And this year, the JC Penney app is offering an early sneak peek to their Black Friday ad before it is publicly released. From scouring weekly ad circulars to checking your favorite websites for the latest updates on sales, this information is everywhere and easily accessible. Follow your favorite stores on Facebook to keep up with the latest updates. It’s not uncommon for companies to offer additional savings to their social media followers. Other sites that you can use to get coupon codes, sales and deals are FatWallet.com and RetailMeNot.com. Another site that is set up as message boards to discuss current deal and coupon codes is SlickDeals.net. Sometimes sites like these can tip you off to other, lesser-known sales that are happening. Hopefully this list will help you get you holiday shopping started on the right foot. Good luck and happy shopping! Halloween is fast approaching and more than a few of us are scrambling to prepare the perfect costume. But food allergy parents have something more than last minute costumes to worry about. According to Food Allergy Research and Education (FARE), food allergies affect more than 15 million people in the United States, including 1 out of 13 children. That means if you are handing out candy this year, either at your door or at trunk-or-treat events, you’ll be dishing up treats to at least a few kids that can’t enjoy them. Depending on the severity of the food allergy, parents might let their children trick-or-treat and swap out what has been collected with treats they know are safe for their kids. But, let’s be honest, that’s not nearly as fun as sifting through your take to see what you picked up along your route. Worse, holiday goodie bags or school events celebrated with food may exclude children with allergies. While exclusion is pretty common for a food-allergic child, it can have a negative impact on their self-worth and social-interactions, as well as potentially intensifying food-allergy related anxiety. However, there are easy, inclusive solutions. For school parties, treat bags can be food-free or the parent of a food-allergy child can be consulted; they may be happy to help prepare classroom snacks so all the children have the same experience without putting their child in harm’s way. Always defer to the food-allergic child’s parent on matters of food. Remember, they spend a great deal of time trying to keep their kid safe, and while you may have the best of intentions, it can be very scary to trust a relative stranger with your kids life. It gets even easier when it comes to trick-or-treating. Be a part of FARE’s Teal Pumpkin Project by setting out a teal pumpkin. The teal pumpkin lets families with food-allergic children know that non-food treats will be offered. Even better, this gives kids who don’t have allergies but might have restrictive diets (such as diabetics) a safe option as well. Below is a list of ideas and a couple of great resources to get prepared even so close to Halloween. And where can you get these fun toys? Retailers from the Dollar Tree to Wal-Mart carry inexpensive toys and gift-bag kits, but you can also order in bulk from Oriental Trading or Amazon when time permits. In the Charleston-Huntington area, The Food Allergy Pharmacist partners with Kroger to host a Teal Pumpkin Project inspired trunk-or-treat. However, she takes it one step further and asks that sponsoring trunks offer no food treats at all. West Virginia State University Extension Service is a sponsor of the event. Join us on Saturday, October 29, from 10 a.m. to noon at the Kroger on 7th Ave/1st Street Huntington and from 4 to 6 p.m. at the South Charleston Kroger. There will be lots of non-food goodies, carnival-style games and a dance party. Happy Halloween! Note: This week, Oct. 9-15, is National Fire Prevention Week, and our friends at the American Red Cross West Virginia Region are here with a guest post about how to minimize the risk of fire in your home and how you can receive a FREE smoke alarm. Last year in West Virginia, the Red Cross responded to almost 700 home fires. Such fires all too often end in tragedy. Seven times a day, someone in this country dies in a home fire. The Red Cross has been working to reduce that number through the Home Fire Campaign, a multi-year effort to reduce the number of home fire deaths and injuries by 25 percent. Launched in October 2014, the Red Cross and thousands of campaign partners have helped save numerous lives through the effort, as well as installing more than a quarter million free smoke alarms in homes all across the country. Install smoke alarms on every level of the home, and check them monthly by pressing the test button. Create a fire escape plan identifying two escape routes from every room of the home and a place a short distance outside of the home where family members can meet after escaping. Practice the escape plan at least twice a year, paying particular attention to children or older adults who may require extra time and care. The Red Cross wants to help you get prepared. Learn how to help prevent a home fire and what to do if one occurs by downloading the Red Cross Emergency App. Visit redcross.org/homefires to find out more about how to protect yourself and your beloved home from fire. To have a free smoke alarm installed in your home, find the location of smoke alarm installation events or to become a volunteer, contact the American Red Cross West Virginia Region at (304) 340-3650 or visit www.redcrosswv.org.